"The Questar is a tool that is appealing to the eye - a work of art and mechanical excellence whose performance and durability tend to keep its owner loyal. Over many years I have come to own and use more than thirty telescopes; at any given time I may own about five instruments. With my interest in so many areas of astronomy no one or two telescopes can serve all my needs well. As I moved from one telescope to another I learned their strengths and weaknesses, and I sought improvement. However, while other telescopes have come and gone the one that has outlasted the others, been used the most, and which I envision retaining as long as I am able to move is my Questar. A Questar is very easy to transport and set up. It is that component in my logic that supports my "the best telescope is the one that gets used" philosophy. A Questar can be set up from its carrying case, Pole Aligned and tracking on a planet in about three minutes. For extended travel I rarely choose a telescope other than my Questar. Sure, the Questar is not as "good" as my larger superb telescopes in terms of what I can see or image. However, my 7 lb. 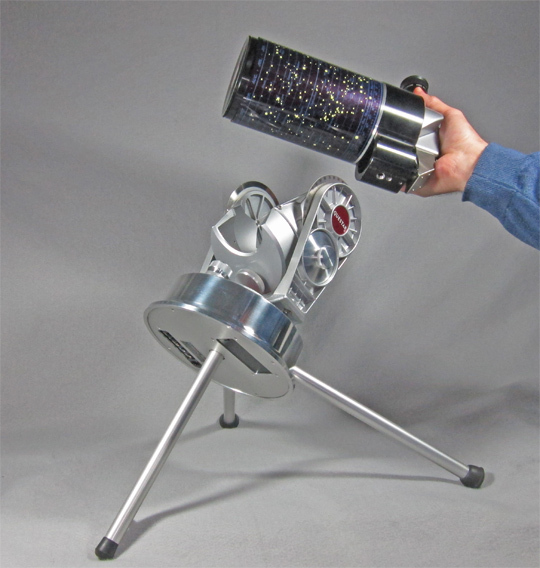 (3.2 kg) Questar with its compact tracking mount is a tool that does what it does more often, better and quicker than any other similar compact telescope on the market, and it looks better while doing so!" Above: Questar Corporation logo with star used from early 1950's to the early 1960's. Demanding people buy Questar, the most demanding buy their Questar from Company Seven. Preface: Company Seven is a highly proficient resource for the international professional astronomical, law enforcement and defense communities; we also serve the more demanding amateur. In addition, Company Seven is so well regarded as expert in this field and have such a special working relationship with Questar that we are the only Questar authorized agent for both their Consumer, and Industrial (Surveillance and Long Distance Microscope and Remote Measurement Systems) product lines. We are proud to present observatory caliber Questars for research, education and recreation to government, industry, and the most demanding amateur. The National Aeronautics & Space Administration (to whom we supplied Schmidt-Camera telescopes for the International Halley Watch), the U.S. Naval Observatory, the Smithsonian Institution, and the satisfied astronomer and nature watcher are our most prominent references. 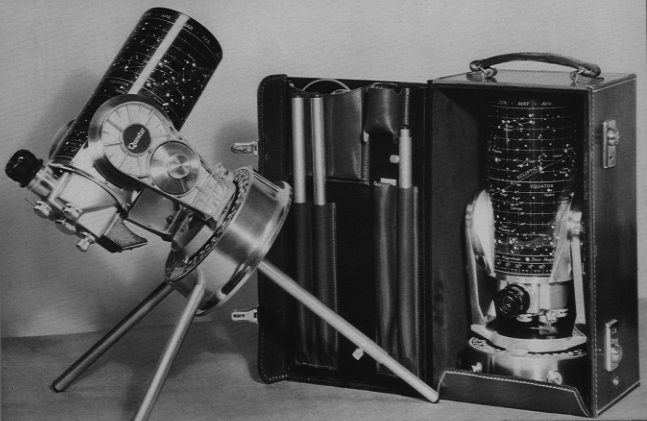 Right: Early 1960's Questar Standard 3-½ telescope shown at left in Polar Aligned astronomical configuration on it's furnished Tabletop Tripod (Standard Center Leg), and also shown to the right stored in original Leather Carrying Case with standard accessories. The Questar telescopes are available in several apertures, each with several configurations, and each configuration with a good selection of options for visual and imaging applications. These instruments are therefore, essentially made to order after we have worked with and counseled the buyer to determine their needs. Introduction: Questar is a distinguished line admired worldwide since the introduction in May 1954 of their first early production telescopes for their high performance, ease of use, their innovations, and for their uncompromising high quality of workmanship and materials. What follows as a logical consequence are most precise, yet durable instruments with virtual jewel-like movements and appearance. These are not merely decorator pieces or gifts of royalty (some custom jewel-encrusted Questars have been presented as gifts! ), Questars are proven performers in use at major facilities. In September 1965 the first telescopic images of earth were reported in "Newsweek" magazine; these images were taken through a Questar from the Gemini spacecraft, and they were news because this was the beginning of surveillance photography from space. When the Apollo astronauts reported seeing a twelve and a half foot object from 1000 miles (1625 km) through a Questar, it was on the front page of the "New York Times". Using a compact Questar in 1985 an airplane hijacker in Beirut was identified from a distance of two kilometers (1.23 miles); in 1986 a Questar was used to identify the cargo being unloaded from a freighter in Nicaragua from twenty five kilometers (15.4 miles). When video evidence of a SCUD missile launcher in Kuwait was presented to the United Nations Security Council for sanction of "Desert Storm", a Questar Step Zoom 180 (a unit only about 9" wide x 24" long) was the instrument used to acquire those images from a distance of thirty kilometers (18.6 miles)! In the fall of 1993 NASA and Company Seven personnel employed a production Questar QM-1 Long Distance Microscope to certify the focus of the $127 million dollar Wide Field Planetary Imaging Camera (WFPC 2) for the one billion dollar Hubble Space Telescope Repair Mission. No other production Catadioptric telescope we have ever evaluated equal the Questar inch per inch or pound for pound in performance or accomplishment! If seeing conditions permit it the Questar 3-½ inch telescopes reveal remarkable details; leaf stems two miles distant are plainly seen, bicycle spokes one mile distant can be resolved (1.4 arc-seconds at one mile is about 1/3 of an inch)! Planet and lunar views (on clear nights revealing colored bands of Jupiter) and photographs rival those of much larger instruments. Questar optics surpass the conventional production criteria for optical surface figure accuracy by a wide margin, this helps to account for their incredible resolution capability. Aside from the quality of optics, the Questar telescopes include patented devices to insure these instruments are compact, free of periodic adjustments, and user-friendly. All of these features evolved before the now popular term "user friendly" was first uttered. These features include a Control Box at the rear of the telescope. The Control Box incorporates built-in magnification changer, an integral finderscope, extraordinarily smooth and precise focusing mechanics, and a finder's solar filter. All of this is may be mimicked at some cost and to lesser degrees of perfection in another telescope. However, what makes the astronomical Questar 3-½ models even more unique is their extreme portability: these are a complete personal portable and power independent tracking telescope, with six magnifications (three from each provided ocular), tabletop tripod legs, superb quality Solar Filter (one for the telescope objective, and one for the finder too) which can show an eclipse and reveal Sun spots and Faculae, all of which store under an average airline aircraft seat within a compact fitted case as shown above. Right: Questar Standard Model 3-½ telescope, left (West) side view showing the integrated Control Box with manual controls for focus, Barlow, and Finder (96,964 bytes). The Standard and Duplex models include control for engaging the finder's solar filter. Otherwise, the Control Box is identical to that provided on the Field Model model too. Click on image to see enlarged view (287,872 byes). "as fate would have it, the skies cleared this evening - I can't believe it! I took a look at Jupiter - very impressive, despite being right next to a street light. The baffling is so good you wouldn't have guessed that street light was there." As an example of how well regarded Questar is, you may consider the reviews of the Questar Field model too. The Field model and it's newer cousin the Birder Model are standards against which other spotting telescopes are judged; "Audubon" magazine has rated the Field model to be the best nature watching scope overall. However, we advise those with an interest in astronomy consider either the Questar Standard or Questar Duplex models. Questar Field Model or Birder: basically a Questar 3-½" Optical Tube Assembly only. These are best suited to those who need the utmost in light weight and compact high magnification performance. Common applications include birding and nature watching, law enforcement, intelligence gathering/remote surveying, public safety, etc. These serve well as a rugged and compact high resolution Ultra-telephoto lens, or in astronomy as a high magnification photo-guide telescope. 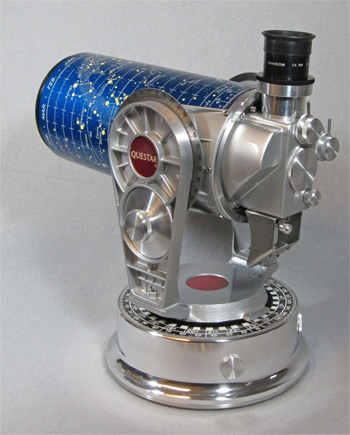 Questar Standard 3-½ Model: the original Questar telescope configuration features a Questar 3-½ Optical Tube Assembly attached in a permanent manner to the Questar Fork Mount. This offers the owner an extremely lightweight and portable tracking telescope, and is a good choice for one who intends to apply the instrument to the role of an astronomical instrument. The Fork Mount provided with both the Standard and Duplex models includes an electric drive mechanism calibrated to permit the telescope to track celestial objects. As the Earth rotates these objects appear to move across the sky, when properly aligned and tracking then the Questar can keep the objects in the field of view of an eyepiece or camera thereby removing the distraction and difficulty of manually trying to follow objects precisely across the sky. The tracking feature also facilitates sharing the telescope with young or inexperienced observers, and the provided setting circles (with functional Moon Map and Star Chart provided on the telescope barrel and Dew Shield) help the operator to learn celestial navigation, and find the otherwise unobservable objects that might otherwise go unnoticed. Questar Duplex Model: a Questar 3-½" Optical Tube Assembly mounted to the Questar Fork Mount in a manner which allows the easy disjoining of optical tube from the mount. This allows the "Duplex" use of of the optical tube assembly as either portable telescope or as an ultra telephoto lens (as the Field Model) without the need to carry the extra bulk of a fork mount. And yet this arrangement still offers the owner an extremely portable tracking telescope when the tube is "docked" into the fork mount. Right: Duplex Model. Notice how the optical tube comes off the Drive Base with the simple turn of one hand knob (19,238 bytes). Click on image to see enlarged view (121,884 bytes). Optical tube assembly, with precision thread-on anodized aluminum lens cover, optical tube barrel has moon map and perpetual star chart the latter extends forward to serve as dew shield. Choice of two Questar Brandon oculars (most clients will discuss their specific needs with us before delivery of the instruments), integral 100mm nominal focal length finder, finder solar filter, off axis Solar Filter for objective, dial-in integral Barlow lens (typically between 1.6X to 2.1X - our in house evaluation and certification program will document this for you), precision integral Zenith prism providing upright and reversed view at eyepiece port. Fork Mount with Azimuth/Right Ascension axis slow motion manual control, Altitude/Declination axis slow motion manual control and lock, Azimuth/Right Ascension position circle (Degrees and R.A.), Altitude/Declination position circle (Degrees), AC drive (specify voltage and frequency), lightweight alloy tripod legs for tabletop Polar alignment of mount, velvet lined Standard Vinyl-Clad Carrying Case with keyed locking latches is approximately 16-1/3 inches (44 cm) H x 9 (23cm) W x 10 (25cm) deep with key locks. The case is fitted with internal pouches to hold standard accessories. The upgrade optional Deluxe Leather Carrying Case features combination lock latches whereby the owner can change the combination to any three digit preference. Both the standard and optional leather cases are easily "carry-on portable", and the telescope with all accessories in its case weighs only about 12 lbs. (5.5 kg). Magnesium Fluoride (MgFl): the Questar optics are furnished with durable Magnesium Fluoride antireflection coatings on the refractive elements, and an aluminized Primary and a Secondary Mirror with each over coated to prevent oxidation. If one is employing the telescope for use only for observing the brightest objects such as in solar, lunar, or well illuminated terrestrial applications then the basic optics coatings are quite suitable. Based on our experience with servicing and overhauling older Questars the standard coatings with any reasonable care and storage will have a service life in excess of 40 years. The visible reflectance of each aluminum layer is about ninety (90) per cent. These aluminized coatings are durable, meeting the adhesion, abrasion, temperature and humidity requirements of MIL-M-13508. This is a standard coatings offering and is provided when ordered with the Pyrex® Mirror, or with the optional Zerodur® Primary Mirror described below. Enhanced Silver Coatings: this option provides the features of the MgFl group but adds a highly reflective silver coated Primary Mirror and Secondary Mirror. The silvered optics are overcoated for durability against oxidation/tarnishing. The visible reflectance of each silvered layer is ninety eight to ninety nine (98 to 99) per cent. Because these coatings increase light transmission and optimize the photo-visual contrast discrimination, these are meaningful options for these systems. Introduced by Questar in a limited basis in year 2001, we have data from the coating lab that leads us to believe this should provide an excess of 15 years of service. These silver coatings pass the adhesion, abrasion, temperature and humidity requirements of MIL-M-13508. This choice is available only when ordered with the Fused Silica (Quartz) Primary Mirror option described below. Broad-Band Coatings: this arrangement consists of an enhanced protected silver film on the Primary Mirror, and a highly efficient multilayer antireflection coating (each coating only microns thin!) applied to both the front (R1) and rear (R2) surfaces of the Corrector Lens. The visible reflectance of the silvered layer is ninety eight to ninety nine (98 to 99) per cent. Because these coatings increase light transmission by about 20 percent and optimize the photo-visual contrast discrimination, they are considered meaningful options for these systems. We do highly recommend this option for low light photographic, video, and visual application. In visual practice colors and subtle contrasting features such as the bands of Jupiter are clearer and more distinct with this option. Based on our experience the Broad-Band coatings option can with reasonable care and storage have a service life well in excess of 25 years. We have seen only one instance of an unusual coatings failure of a Questar, and this was in a nine year old instrument serviced in 2001; even though this instrument was well beyond the factory warranty Company Seven and Questar insured our customer did not pay for the solution to this problem. The silvered aspect of this coatings group pass the adhesion, abrasion, temperature and humidity requirements of MIL-M-13508. This is an optional coatings ensemble that is available with the Pyrex® Mirror, or with the optional Zerodur® Primary Mirror. "I own a Questar 3-½ Duplex telescope and chose the Broad Band Coatings since the differences in view are perceptible. It has been worth the cost difference, over the years of observing I am enjoying. The only factor against this option might be longevity of these mirror coatings - this is more so a concern for those who can not maintain the telescope stored in a dry environment when not in use. Yet I find this concern minimized by the knowledge that after twenty to thirty years the optics can be coated again if necessary. There are facilities with the equipment to perform this service even if for some reason we were not available in the distant future to do so. But as coatings technology has improved, so has their longevity and accordingly we have seen fewer and fewer older instruments that develop any need to have their mirrors coated again." The materials used to make telescope mirrors are characterized by a number of terms including Coefficient of Thermal Expansion, Thermal Conductivity, and Specific Heat. Most telescope mirrors expand or contract in response to temperature changes. When comparing this change with width of the wavelength of light then one can comprehend how a change of a mirror's curve can cause results at the telescope focal plane that are perceptible to the eye. Coefficient of Thermal Expansion is the measure of how a material expands or contracts in response to temperature changes. Coefficient of Thermal Expansion can be expressed in terms of centimeter(s) of change per centimeter of material thickness, per degree change. If a telescope is likely to be moved from a hot car or warm room to a cool environment, or from a cool room to hot night then it is best to specify a mirror material that does not present significant expansion concerns with temperature changes. For example consider a Pyrex® glass, with a Coefficient of Thermal Expansion of 32.5 x 10-7 cm/cm/°C. This means when a sheet of Pyrex® 25.400000 mm (1 inch) thick is exposed to a temperature increase of 10 Degrees C (50°F) it will expand and then measure 25.4021844 mm thick. Since the wavelength of peak visible light is about 0.00000055 mm, this mirror surface would have moved nearly four wavelengths from its original position over that time necessary for it to complete the change. Thermal Conductivity: characterizes the speed with which heat is conducted through the mirror substrate; the faster this occurs, then the faster the mirror acclimates. This quantity is often expressed in terms of Watt per meter degree Kelvin (W/mK or W/m°). Specific Heat: the measure of how much energy must be absorbed by the material to raise its temperature. This can also indicate the heating capacity of that material too. A comparatively higher Specific Heat means the material will take longer to stabilize its figure. We often provide this measure in terms of how many calories of heat energy must be provided to raise one gram by one degree C.
low Specific Heat to reduce the time needed to attain the nominal optical figure. The mirror materials offered with the Questar are Pyrex®, Zerodur®, and Fused Silica. Either material can be polished to a similar quality, and so they each can afford the same high quality of view assuming the Pyrex® has acclimated to the observing environment. Corning Pyrex®: The standard Primary Mirror provided with the Questar is made of Pyrex® glass. Marketed since 1915, Pyrex® is a borosilicate glass composition made of Silicon, Boron, Sodium and Aluminum. Pyrex® provides good chemical, thermal, mechanical and optical properties. It's density is 2.23 g/cm3. The Coefficient of Thermal Expansion is (0 to 300°C) is 32.5 x 10-7 cm/cm/°C. Its Specific Heat (at 25°C) is 0.185 cal/g°C, and Thermal Conductivity are 1.129 W/mK at room temperature. If one plans to use a telescope only in temperate climates, or can store the instrument in a secure place that is close to the outdoor temperature, or if cost is a concern then the standard Pyrex® glass mirror will do very well. Schott Zerodur®: an optional ultra-low expansion optical glass ceramic semi-alloy. The Zerodur® primary mirror combines rigidity with thermal stability. The high quality of the raw Zerodur® specified for use in the Questar addresses concerns of mean coefficient of linear thermal expansion, inclusions, striae, and bulk stress. The most important and significant properties of Zerodur® are the extremely small coefficient of linear thermal expansion as well as the homogeneity of this coefficient throughout the entire piece. Unlike the standard Pyrex® glass mirrors composed of solids including silica, Zerodur® has a crystalline matrix with boundaries smaller than the wavelength of visible light. As all optical systems must adjust to the ambient temperature before images are truly at their sharpest it will be found that Zerodur® will perform better than Pyrex® where ambient thermal variations are particularly pronounced. At low temperatures especially, Zerodur® will stabilize its figure faster than Pyrex®. We suggest this Zerodur® option for customers who observe in winter conditions, particularly where the time required to acclimate a Pyrex® mirror poses an inconvenience. The density of Zerodur® is 2.53 g/cm3. The Specific Heat is 0.196 cal/g°C (at 25°C), the Thermal Conductivity is 1.64 W/mK, while the linear Coefficient of Thermal Expansion is 0.05 x 10-6/C between 20 to 300°C. Quartz/Synthetic Fused Silica: another optional low expansion material, the optical grade synthetic quartz primary mirror combines rigidity with excellent thermal stability over a range of practical operating temperatures similar to Zerodur®. Our optical quality Fused Silica mirror does not seem to retain heat as long as is possible in the Zerodur® option. This expensive material has qualities that make it easier to work to a high degree of perfection in an optical fabrication facility and so each optic set we provide with a Questar 3-½ will be made to at least 1/10 wave front (cumulative error of the combined four surfaces) with our highest RMS performance, and then provided with a certification and interferogram print out. The density of synthetic optical grade Fused Silica is 2.203 g/cm3. Its Specific Heat is 0.177 cal/g/°C (at 25°C), the Thermal Conductivity is 1.38 W/mK. The linear Coefficient of Thermal Expansion is 5.5 x 10-7°C. This is the most rarely specified Primary Mirror options made available for the Questar telescopes due in measure to its high cost. If anticipated uses of a Questar including solar observing or imaging then the more thermally stable Zerodur® or Fused Silica may be employed in place of Pyrex® to reduce changes of focus during critical time lapse studies, or public observing sessions. The Corrector Lens of the Questar is made of a very high quality Borosilicate crown glass. This thick yet highly transparent lens guarantees the Questar remains an Apochromatic system with a good spectral response of between 330nm to 2.3 microns. Right: Questar 3-½ telescope Corrector Lens with Broad Band Low Reflection Coatings upgrade. Note Secondary Mirror mask (35,547 bytes). Company Seven does offer an optional corrector lens. By replacing the standard Borosilicate Crown (BK-7) material used in the transparent Questar Corrector with UV grade optical Fused Silica we can provide wider spectral response and higher quantum efficiency available of between 180 nm to 2.5 or 3.5 µm. This has no practical value for the amateur astronomer since the human eye is insensitive below about 400 nm. And for astrophotography this provides no advantage since the Earths atmosphere in absorbs most UV before it reaches sea level. However, as we destroy our protective ozone boundary amateurs may find more and more use for Fused Silica correctors. The Standard and Duplex Questar models are furnished with a fork style drive base with a set of three very lightweight alloy legs. The legs thread into the drive base at two points on the side, and one at the bottom to form a tripod that is adjustable for latitude (as shown above). This tripod permits the telescope to operate off of a table top. The drive base incorporates a geared Cramer or Synchron 120 Volt 60 cycles A.C. (220 volt optional) synchronous motor, cord socket installed in the bottom cover of the Fork Mount Base, and power cord. The AC cord plugs into a wall outlet. The motor turns at a rate of 1/2 revolution per hour, and with the gearing of the telescope base this provides a Sidereal Tracking rate suitable for following most celestial objects. Right: the Questar 3-½ telescope AC synchronous motor with power cord receptacle provided as standard equipment in the base of astronomical models. At first glance the 115 and 220 volt motors appear identical. This example was removed to retrofit a Powerguide II system (35,547 bytes). An AC powered system made for use in the Northern Hemisphere tracks just fine from east to west. However, motors for use in the Southern Hemisphere incorporate a reversed motor so these will track in the opposite direction of those motors sold for use in the Northern Hemisphere. This arrangement is completely satisfactory for a person who operates the telescope for viewing only from one location that has A.C. power (such as at a school), and who does not intend to travel to other hemisphere or to other countries where the voltage or frequency (cycles) differ from their home current. The optional drive system for the Questar is the Powerguide II. Powerguide is one of the most important innovations for the Questar since its introduction. The drive base operates from a common alkaline 9 Volt D.C. battery (in the hand control box) for up to 50 hours, longer with a Lithium battery! A drive corrector circuit with hand control paddle permit functions including the selection of drive rate (Lunar, or Sidereal), and fine speed correction changes of +-1.4 or 10X. All control is done with "On Off" switch, and four (E-W-N-S-) buttons. There are no switches on the drive base - all is on the hand paddle that plugs into the bottom of the base. An internal Quartz reference circuit continuously checks motor speed (every 0.6 Arc Sec.) and adjusts it if necessary. But the most important aspects of this option are that it frees a person to travel around the world, to the North or South Hemisphere independent of external power supplies. The Questar is very good for Solar Observations and is in fact provided with some capability in this area. It remains a very popular choice for Eclipse chasers. In part because of its extreme portability, optical excellence, and worldwide tracking capability. You should read a book such as that written by by Beck, Hilbrecht, Reinsch, and Volker which we offer and have described at Solar Astronomy Handbook. Left: Questar 3-½ telescope Off Axis and Full Aperture Solar Filters in thread on Cell (24,054 bytes). The Questar Solar filter is designed to provide safe "white light" views of the surface details on the Sun including Sunspots and Faculae. The Questar filter elements are made in an optics facility nearby Company Seven, they are well regarded for their ability to produce optical flat elements. These elements feature excellent freedom from wedge, and very smooth polished surfaces; these make superb glass windows for high resolution applications. A Chromium evaporate is deposited onto the polished parallel flat element so that only 17 millionths of the light from the Sun will pass through the filter. All harmful infrared and ultraviolet rays are rejected. The Sun is presented as a very pleasing, Orange Red disk framed against a black background. 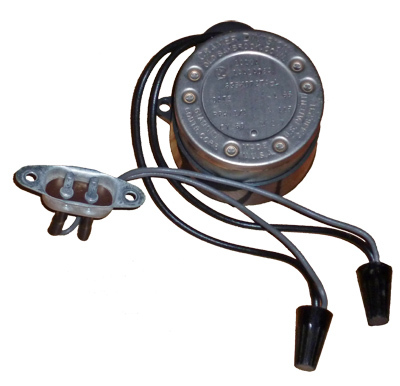 The filter element is housed in a precisely machined aluminum cell which is anodized black. The cell features vents designed to reduce any possibility of heating the telescope corrector lens. The Off Axis model is provided with each astronomical Questar telescope. This is an economical alternative to the Full Aperture Filter and should be suitable for casual sunspot observing. The optional Full Aperture Solar Filter is about five times brighter, and provides nearly triple the resolving power of the Off Axis filters. The Full Aperture Filter will show much finer details in sunspot structure, and Faculae on steady observing sessions. The full aperture filters are the most attractive for serious study and imaging of the Sun. Each astronomical Questar is equipped with a Finder Solar Filter. This is a mechanical assembly provided so that the observer way dial the Solar into use or into a stored position over the telescope Finder. This facilitates finding and centering the Sun in the telescope. When in place this filter also prevents the accidental observing of the Sun if an inexperienced user accidentally dials in the Finder observing setting on the Questar Control Box. The astronomical Questar 3-½ telescopes are provided with a dark blue velvet lined, wood framed vinyl clad carrying case. The case appears at first glance very much as though it were clad in leather. The dimensions of the vinyl clad case are approximately 16-3/4 inches (43 cm) H x 9 (23cm) W x 9-1/4 (24cm) deep with key locks. The case is fitted with internal pouches to hold all standard accessories. When ordering a new Questar you may apply a credit from the vinyl case to substitute the Deluxe Leather Carrying Case instead. The upgrade optional leather case appears very much like the vinyl case, but the only tell tale difference from a distance is that the leather case features combination lock latches; the user can change the combination to any three digit preference. Both the standard and optional leather cases are easily "carryon portable", and the telescope in its case weighs only about 12 lbs. (5.5 kg). This choice is a matter of personal preference. In fact we have some customers who have bought both cases, reserving the leather case for special trips while using the vinyl case when going out to dew or high humidity primitive observing sites. Among the overlooked items to be considered when ordering your telescope is the choice of Tabletop Tripod Center Leg. The astronomical Questar 3-½ telescopes are provided with a Tabletop Tripod consisting of two fixed length Side Legs, and one adjustable length Center Leg which attaches onto the center of the Fork Mount Base. When you order your telescope from Company Seven, then we will automatically specify the appropriate solution for you. The Standard Leg extends from 9.2" (233mm) to 16.75" (425mm) and this permits Polar Alignment when the Questar 3-½ the Fork Mount is used between 30 to 45 degree latitudes. Customers who intend to use their Questar at latitudes of between 40 to 54 degrees should order the High Latitude Leg option. For example this includes locations such as: Calgary, Montreal, London, Amsterdam, Kiev, Tasmania and areas of New Zealand, Argentina, and Chile. The 3-½ Center Tripod Leg - High Latitude option will extend from 6.5" (165mm) to 11.5" (292mm) long. This may be ordered in place of the Standard Tripod Leg with new 3-½" Astro telescope. If you ever find yourself traveling to a location where the legs are not appropriate, then it is a simple matter to use a book or other platform to tilt the Base to the appropriate angle. As you near the Equator however, it will be necessary to stabilize the stand by attaching it to a suitable Field Tripod with Head, Tristand with Equatorial Wedge, or other home made solution. Questar routinely ships any new astronomical Questar telescope with two Questar Brandon 1.25" eyepieces providing about 50X and 80X. The Barlow included in the Questar Control Box vary in magnification from one production lot to another so that either a 12mm or 16mm eyepiece may be redundant, because of this most of our customers who wish to use Questar Brandon eyepieces will choose the 24mm and then leave the second choice up to the discretion of Company Seven. Our acceptance testing process of each new telescope measures the magnification of the Barlow and will permit a better informed choice to be made. Furthermore, Company Seven permits our clients to substitute Questar Brandon or third party eyepieces. Alternatives we offer can provide: wider fields of view, longer eye relief, operation of the telescope at lower and higher magnifications than the limits imposed by the available 32mm to 6mm Questar Brandons. Third party eyepieces allow the owner to choose from a greater selection of thread in color, light pollution, and neutral density filter. We outline the recommended eyepieces for your Questar in the data we provide with those telescopes that we sell, and we go quite in depth on the subject of eyepiece selection in our complimentary training programs that are offered to our clientele. Standard 3-½ telescope with Magnesium Fluoride Coatings, Pyrex® Primary mirror. Standard 3-½ telescope with Broad Band Low Reflection Coatings, Pyrex® Primary mirror. Standard 3-½ telescope with FS Coatings, 1/10th wave Fused Silica Primary optics. 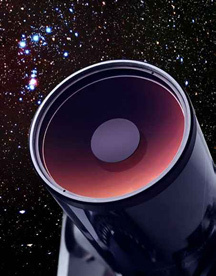 Standard 3-½ telescope with Broad Band Low Reflection Coatings, Zerodur® Primary mirror. Duplex telescope with Magnesium Fluoride Coatings, Pyrex® Primary mirror. 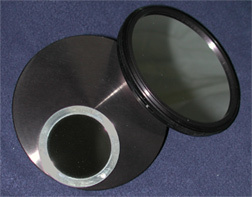 Duplex telescope with Broad Band Low Reflection Coatings, Pyrex® Primary mirror. Duplex telescope with Broad Band Low Reflection Coatings, Zerodur® Primary mirror. Duplex telescope with FS Coatings, 1/10th wave Fused Silica Primary optics. Anniversary Model telescope with FS Coatings, 1/10th wave Fused Silica Primary optics. Other popular accessories for the for Questar 3-½ astronomical telescopes include Piggyback Mount, a wide selection of third party oculars, color and light pollution rejection filters, etc. A complete list of Questar accessories is posted at our Questar pricing page. We prefer to speak with you in some detail to discuss the possible configurations and options regarding the Questar as there is little information about these and their compatible mounts in print. We suggest that anyone interested in astrophotography with a telescope attempt it only after they have some experience with using the telescope, pole alignment, and finding their way across the night sky. One should concentrate on visual accessories and practicing with the telescope for several months. When you are confident that you are ready to proceed into this area of the hobby, then please feel free to contact us again to discuss your goals in detail. You may wish to begin by considering a good book on the subject such as Astrophotography for the Amateur written by Michael Covington. There are several basic techniques employed which must be practiced and learned for successful imaging with a Questar or any telescope. Each has its uses or limitations. Some of the accessories and techniques are discussed in our article regarding photo at . Furthermore, we describe a number of our more popular integrating astronomical CCD imaging cameras at our SBIG section for example. The Warranty is void if the instrument is serviced or tampered with by an unauthorized service center, or owner. Company Seven would be your first source of support or advice should the need arise. Furthermore if a defect is found in any of our telescopes (a very rare occurrence) then Company Seven can arrange for the return of the instrument to us for repair or adjustment, and then return to the customer at our expense. Company Seven will accept orders placed by E-mail to or placed online. However, these must be reinforced by a signed copy sent via facsimile or conventional mail. Company Seven, P.O. Box 2587, Montpelier, Maryland 20709-2587. Company Seven, 14300 Cherry Lane Court, Suite 117, Laurel, MD 20707. We typically require between four to eight weeks from the date an order for the fabrication, assembly and testing of a new Questar. The telescopes are so carefully examined and tested (optics, mechanics, electrical, and cosmetic) at Company Seven prior to delivery to a customer that a failure is not likely to be found. Indeed not all new telescopes that we receive meet our standards. We have returned several new instruments for adjustments of problems including de-centered optics - a slight mechanical tolerance variation in production, or other modest anomalies. The deficiencies were not detected at assembly, or no other retailer approaches our quality of services or competence. If a telescope does go out of Company Seven that does not meet any of our customers criteria, we will pay the freight to return an instrument, then make the adjustment and return that instrument to the owner - any where in the world! If your Questar ever comes in need of Questar authorized service or repair, then it too can be serviced here promptly. 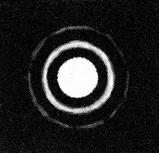 Right: Star test diffraction pattern typical of a Questar 3-1/2 telescope, one of the finest telescopes in regular production. Furthermore as every telescope is processed we generate a comprehensive report characterizing the photo-visual and CCD performance parameters including Barlow amplification of your telescope. This includes suggested ocular and accessory combinations for the particular telescope. Any telescope sold through Company Seven will meet stringent requirements, those we hold the Questar to will befit a telescope that is represented to be the standard of excellence and is priced as the Questar is. The Questar 3-½ astronomical telescope is delivered securely packaged in its carrying case, packaged within a small packing drum. The drum is packed within a card board shipping box. The box dimensions are 22 x 22 x 24 inches (55cm x 55cm x 60cm). The shipping weight will be about 29 lbs (13 kg). Deliveries may be made at our showroom in Laurel, Maryland or packaged for delivery worldwide. International inquiries are so common that we have added information at our Internet web site advising how to order from Company Seven from around the world, this includes advice about how payment and delivery are made. The shipping and insurance costs for one Questar 3-½" telescope sent by air service with delivery in 2 business days to most destinations in the continental U.S.A. rarely exceed $80. The shipping and insurance costs for one Questar 3-½" telescope sent by air service with delivery to Europe are between $200 and $300. More secure Next Day Air rarely exceeds $450 to all parts of the world. Air shipping rates are based on a "dimensional volume" calculation; this is a formula employed by air carriers to charge the higher of either actual weight or a rate based on size of the package. This rate may vary only slightly from one order to another. There are no taxes or customs duties due for a telescope that we deliver to out of state (Maryland) or to out of the country. Company Seven will not provide estimates on Customs duties and taxes since it is beyond our ability to contact foreign customs agents and converse with them about such matters. Company Seven suggests that you discuss this with your government representatives. If the acquisition is for a University or other non profit agency, then it is possible that any import taxes and duties would be "waived" by the government. There may be additional forms and documents that you may have to provide to Company Seven so that we can include them with the telescope when it is shipped out. For export shipments (out of the USA) there will be an additional fee of $25 for Company Seven to prepare the necessary "Shippers Export Declarations". Payment is due when we are ready to make delivery of the order. The most convenient forms are by cash, or by check payable through a U.S. bank. We also accept U.S. based VISA or Mastercharge credit card for sales sent to U.S. addresses, or foreign cards if the order is picked up at Company Seven's showroom. Company Seven will also accept payment by International Money Order, Wire Transfer to our account, by PayPal, or by Western Union. Please inquire for details. Company Seven is a registered US Government Contractor. Our Defense Logistics Agency and ORCA registrations information are available on request. When you accept delivery of a Questar, then we suggest if at all practical that you attend our complimentary introductory program on the telescope; this is among those extra benefits we offer and this helps to account for the long term success our customers enjoy. The introductory program for a Questar telescope averages six to eight hours of instruction over one session usually held at our showroom. Attendance is limited to between one and four parties. Our customers have found our materials, combined with such training has proved invaluable to their long term success. We hope this overview will have helped you to at the least better focus any following inquiries. And we invite you to visit our showroom near Washington, D.C. to see a Questar first hand, or contact us with any questions by E-mail to info@company7.com, or by telephone at 301-953-2000. The showroom is open Monday to Friday 11 am to 6 pm, Saturday 11 am to 5 pm. We are closed on Sundays, on U.S. Holidays, and from Christmas 25 December through 1 January inclusive. 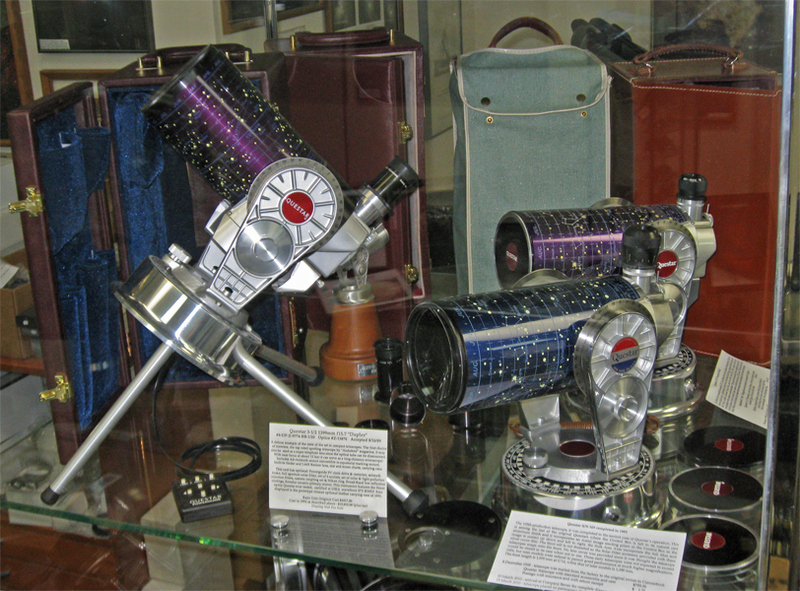 Above: Some of the current, early (1955) and mid (1961) production Questar telescopes displayed at Company Seven (116,003 bytes). Click on image to see enlarged views (416,128 bytes).